Home News archive Nooteboom Euro-PX 2+5 and Volvo FM 5-axle Heavy Transport Tractor for Boer B.V.
Boer B.V. from Meerkerk recently put into service their first Volvo FM 5-axle heavy transport tractor with 540 hp and GCW of 150 tonnes. The tractor has air suspension all around and is equipped with a 9-tonne lift axle with air suspension so that the combination is extremely manoeuvrable. The vehicle will be used to transport equipment such as pile drivers. For this purpose they opted for an ultra-low cab height. The Volvo FM was supplied by the Volvo Group Truck Center from Gorinchem in the Netherlands. 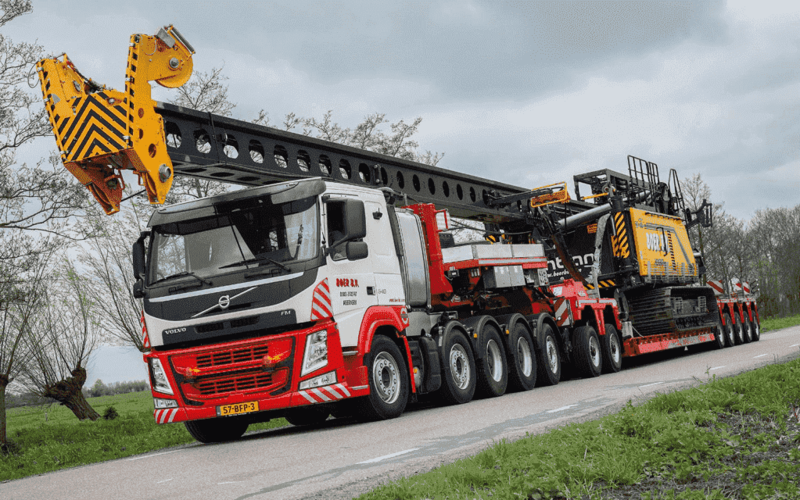 The Volvo FM of Boer B.V. has 540 hp and will be used to transport pile drivers. For this purpose they also purchased a special Nooteboom Pendel-X Euro low-loader 2+5, type EURO-136-25(ICP). The GCW of this combination, including the Volvo FM, is 150 tonnes and provides a payload of 99.9 tonnes. The low-loader is equipped with a removable, low load floor made with beams that can be replaced with a short coupling element. This means the combination can also be used as a 7-axle line Pendel-X semi low-loader to transport heavy, concentrated loads. Because the pile drivers protrude they opted for a Volvo FM with a low cab. In order to improve the driving comfort even more, Boer B.V. opted to add Volvo Dynamic Steering. This steering-stability system makes it possible to drive the truck with minimal effort and reduces the risk of overburdening the driver. “Not only is the Volvo FM extremely manoeuvrable due to its self-tracking axle, with the Dynamic Steering it also steers like the proverbial greased lightning. This is extremely useful on the sites with very little space where our drivers have to go. And hopefully it will prevent them from being stressed out”, says Arjan Burger.